The well known Hindu temple dedicated to Goddesses Ashtalakshmi in Hyderabad is Ashtalakshmi Temple. The group of eight Hindu Goddesses, who represent wealth as well as powers of Shri Lakshmi forms as Ashtalashmi. This temple is one among the two temples of Goddess Ashtalakshmi in India and it is located in outskirts of Hyderabad. Under the supervision of Kanchi Kamakoti Peetam and with the help of well-known architect, Ganapati Sthapathi, the Ashtalashmi temple was consecrated in April 1996.It took around five years and ten million rupees (approximately) to successfully build the magnificent temple and soon it became holy shrine for the devotees of Ashtalakshmi who come from various parts of the country. Subbaiah Sthapathi, an artistic genius designed the replicas of Sriman Narayana, Sri Garuda, Sri Ganapathi and Ashtalakshmi. Apart from these replicas, the chief gopuram which is the inner part of the temple is installed with idols of eight postures which include Adilakshmi, Aishwaryalakshmi, Santanalakshmi, Dhanalakshmi, Dhanyalakshmi, Gajalakshmi, Vijayalakshmi and Varalakshmi, this temple also has about 134 idols of lesser known gods which augment the brilliance of the mahagopuram. The idols inside the chief gopuram are decorated with gold, kasulu pearl and other necklaces. At nights, the sight seeing of the temple is spectacular, it looks like a temple made from marble though it is built with the blend of sand and cement. 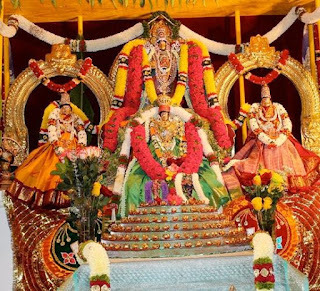 Best time to visit : During Varalaxmi pooja and diwali.